After a long break, much longer than I expected, I'm ready to get back to developing the AI traffic system. Given that the majority of development activities will probably fall under the category of "core development", it's my intention to keep development discussions focused on the mailing list. See https://sourceforge.net/p/flightgear/mailman/message/35485443/ for my initial post. I just wanted to use this opportunity to state that things are moving again, and use this topic to give occasional updates on my progress. As you can read in my post to the developers list, I'm inclined to break away from the approach I took for the current AI traffic system. The code has become too clunky too be maintainable. I will try to spend a limited portion of my development time for bug fixing the current code, but please don't expect any major changes any more. The new approach I have in mind should surpass everything we currently have, but it's going to take some time until it's all implemented. Having said that, it's my explicit intention to make the new system 100% compatible with the current content (traffic database, AI Aircraft, liveries, etc). I also want to state that I am hugely impressed by the amount of good work that has been done to FlightGear's AI traffic in the almost four years that I've been away. This work is one of the major motivations for me to get back to core development. Finally, although I want to keep the technical side of the discussion focused on the mailing list, as per project policy, I'm open to suggestions for improvement from content developers. I am also available for testing and help specifically with "general/light aviation" if you need it. One of my favorite parts of FG is seeing the smaller GA airports come to life. up a modular AI system. That code can already "inject" arbitrary traffic into fgms using the MP protocol, using a tiny subset of the whole protocol. This whole thing works by setting up a single SGSubsystemMgr, so that you can directly reuse existing FG Subsystems (think properties, autopilot) without causing additional work. Ultimately, this approach would mean that even things like tanker.nas or the Bombable addon (both of which are using your AI system) could be running in a standalone fashion if people really wanted to (in fact, SGApplication contains a stripped-down Nasal interpreter, too). With the disclaimer that I (more than usual) is a layman when it comes to (at least) the implementation of things like this, I think it indeed would be a good idea to have an abstraction layer allowing more flexibility, at least if it does not come at a performance penalty. I think that almost anything that makes away with hardcoded assumptions and makes for better flexibility will be a good thing in the end. durk wrote: James and I have plans to unify our approaches. One of the reasons why I have put my plans to implement SIDs and STARs, as well as more complicated airway following in flight flightplans on the back burner is to give James some time to finish is work on the route manager. This way we can work towards a common format that is shared between the route manager and the AI system. Actually, there is a surprisingly comprehensive amount of feedback and information aggregated in the form of a handful of wiki articles whose creation was inspired by recurring debates on the forum/devel list where people wanted to do certain things with the AI system that simply are/were not possible (at the time). Now, to be fair, most people may not particularly appreciate the "format" of these articles (these pages largely consisting of quotes gathered from various places), but it is still true that we have tons of pretty high-quality feedback that is merely waiting to be reviewed, filterered and prioritized by someone familiar with the corresponding system/code, its limitations and possible approaches to tackle these challenges. If in doubt (and given the amount of feedback), my suggestion would be to specifically focus on feedback/statements made by other core developers or those involved in the corresponding AI/MP departments (fgms/MP devs, maintainers and operators), but even then, there is a fairly massive amount of useful feedback available (e.g. look at comments made by Curt, David M or even Durk and Oliver themselves, made over the course of many years). Many of these discussions took place despite the AI system not having been actively developed/maintained at the time, which is a testimony to its success, i.e. people wanting to use it for all sorts of interesting purposes, despite its maintenance status. From a maintainer's standpoint, this may admittedly be (pretty) annoying - but it is still true that there is quite a community of potential contributors that could be leveraged if the AI system would be updated (e.g. look at Stuart's work, bugman's FGPythonSys experiments, fgogel etc). As has been suggested on the devel list, a proper RFC document would probably be a good idea - gathering feedback from different parties/people and weighing that accordingly. Thanks for the pointers. It sounds like the FGAIS system is conceptually very similar to what I have in mind. Whether or not I can reuse any of this code needs to be seen, but it's good to know that other people have already started working on this. That sure sounds like a pretty obvious bug - but as has been stated in the original posting, "troubleshooting" the whole shebang is far from straightforward due to timing dependencies - i.e. traffic schedules, so that certain bugs many only ever show up if you're testing the whole thing long enough, and like you say, you literally need to look behind the scenes by using the property browser to see what is going on under the hood. That is one of the reasons why the reworked ND code created by Gijs can be configured to show the perspective of any AI/MP target - for debugging purposes, i.e. to check if what another entity is doign is actually consistent with what it is supposed to be doing (the dialog in the upper right hand corner showing the perspective of an actual AI target, i.e different position, heading/routing etc). 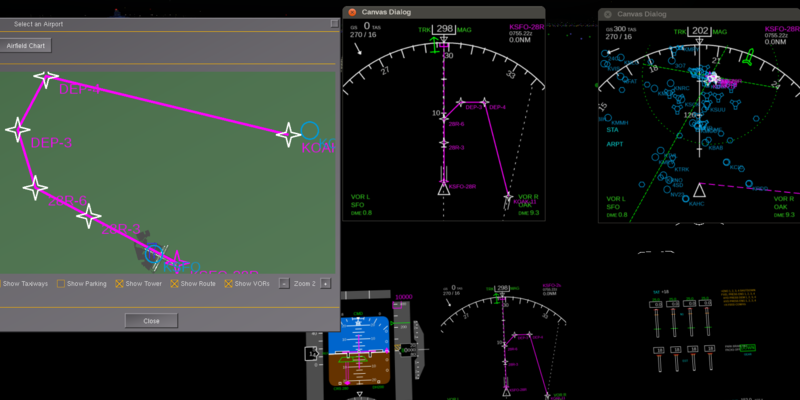 It would be straightforward to also show a corresponding PFD or other useful avionics to tell what is going on, possibly even overlapping multiple flight plans in the same dialog/map or showing an ATC perspective. Referring to the ongoing discussion on the devel list (to which I am not subscribed, just lurking), if you were not a core developer, I would say that it would be a little far-fetched to expect you to become an MP expert anytime soon - if I were interested in this sort of thing, I would much rather review the AIBase code to come up with an interface (abstract base class in C++) to define the common APIs, e.g. set/getAltitude(), set/getLatitude(), set/getLongitude(), set/getOrientation() etc - at that point, you would have a fairly simple interface, which you could then implement (inherit from) by asking the corresponding folks to fill in the implementation specific code (e.g. the fgms/MP folks for the existing MP protocol or Stuart/Mathias for anything involving HLA/RTI or SimKit). The point being that you simply cannot juggle networking stuff if you have never done this sort of thing, and that the networking folks won't be too interested in learning all the ins and outs of the massive AI code base. Besides, UDP is simple enough, so that you don't even need an actual "connection" necessarily - it's mainly about packet marshalling, i.e. XDR-encoding messages and sending them onto the wire. Using this sort of approach, you could have a standalone programm/process (or thread) finished within just a single weekend, because you would never do any actual networking programming yourself, but only ever call the child classes provided by other contributors (note that Stuart mentioned specifically being interested in this sort of thing as part of his HLA/RTI effort). Obviously, YMMV, but if you don't have any experience with/interest in network coding, I would definitely recommend to consider this option, i.e. more bang for the buck.